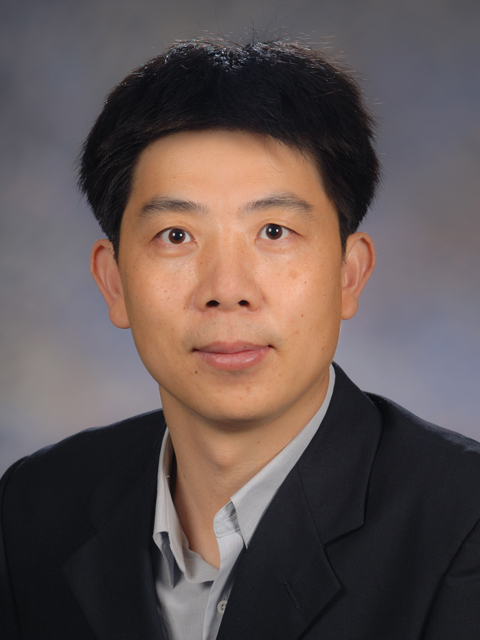 Jiangeng Xue’s research focuses on the science and engineering of electronic materials, particularly organic and hybrid organic-inorganic electronic materials. Xue’s current research is focused on: (1) deepening our understanding of the fundamental physical properties and processing of organic and hybrid organic-inorganic electronic materials; and (2) developing novel electronic and photonic devices based on these materials that either have interesting performance characteristics or are suitable for practical use. The device applications include photovoltaics, lighting, displays, photodetection, circuitry, and chemical sensing. In the last five years, Xue’s research group has achieved a number of important breakthroughs in the field of organic and hybrid electronic materials and devices. In the area of light-emitting devices (LEDs), which have important applications as energy-efficient displays and lighting devices, he has demonstrated a wide range of blue, UV/blue-violet, white, and infrared LEDs with record efficiencies, such as white organic LEDs with efficacy of ~100 lm/W, which far exceeds the efficacy of fluorescent light. Xue has also demonstrated the fabrication of multilayer quantum-dot based LEDs, using low-cost solution process, and achieved low voltage operation and record efficiencies. This particular work has led to the creation of NanoPhotonica, Inc., a start-up company which has established its own R&D facility in the UF Innovation Hub. Another focus area of Xue’s research is organic-based photovoltaic (PV) cells, which have the potential to drastically reduce the cost of solar electricity production. His work in this area contributed to the understanding of materials physics and chemistry, device physics, and optical engineering. He has demonstrated PV efficiency enhancement approaches by using molecular nanorods and crystalline molecular templates. Xue has further developed novel optical structures to enhance light absorption in many different kinds of thin-film PV cells by up to 60%. A novel interface engineering approach was applied to organic-nanocrystal hybrid PV cells, resulting in record high efficiency in this type of devices.